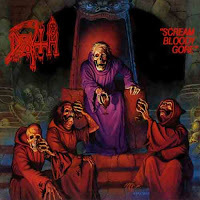 The experimenting in extreme music arrived to a fixed and certain point after Death's "Scream Bloody Gore" came out. It was the first real manifestation of death metal. If we look on the rare tryings in the '80s how metal music became occasionally wilder than usual, this album showed something far more brutal, than anyone else could have imagined before, and by this point a new genre was born. Death and Chuck Schuldiner himself are something similarly basic and unaviodable in death metal, like Bathory and Quorthon are in black metal. It was really something revolutionary which caused the rise up of a notorious genre, and inspired countless of other bands. It's hard to pick up any features about this album, becuase it became all-in-one cultic. The dirty, noisy sounding, which gives an impression that the music is heard from some kind of dungeon, the unstoppable sickness that forging ahead by this intensiveness and insane screamings. The rotting corruption and the stench of death could be easily felt by such musical background, horror inspired lyrics and insanely distorted vocals. Chris Reifert (Autopsy) and Chuck Schuldiner both were very young when they wrote and played up this album, but they wrote a new chapter in metal history with it.